The Overseas Chinese Overland Challenge was unveiled in <?xml:namespace prefix = st1 ns = "urn:schemas-microsoft-com:office:smarttags" />Cape Town on February 26, and arrived in Durban on the evening of February 28, passing Port Elizabeth and East London. 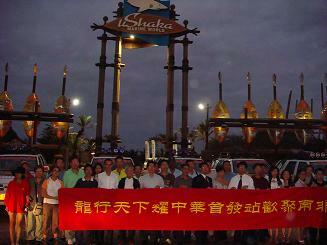 The Chinese Consul General in Durban Mr. Liu Yantao hosted a reception for the team in uShaka Marine World, expressing great respects and supports to the whole team. The next stop is Johannesburg. Seven years ago, the night of July 13, 2001 was a sleepless night for all Chinese around the world, full of excitement and glory, because Beijing became the host city of 2008 Olympic Games. Now, the 2008 Beijing Olympics is waving to the world. The passionate overseas Chinese are inspired to support the 2008 Beijing Olympic Games and initiated the first Overseas Chinese Overland Challenge for the Success of the Beijing Olympic and Glorifying of China. 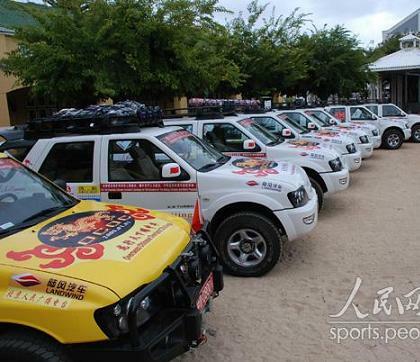 14 team members and 13 media workers will drive 8 Made-in-China Vehicles across 8 Time Zones in African, European and Asian Continent over 80000 miles, and arrive in Beijing before 2008-08-08, when the Beijing Olympic Games will start. 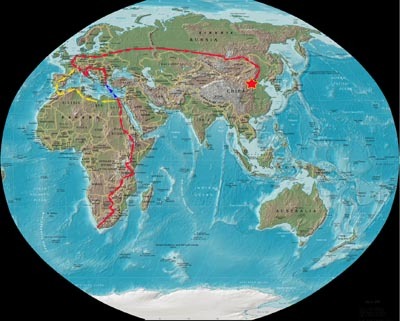 The cross-continent journey starts from Cape Town of South Africa, via Botswana, Zambia, Tanzania, Kenya, Ethiopia, Sudan, Egypt, Greece, Macedonia, Serbia, Croatia, Slovenia, Italy, Sweden, France, Belgian, Netherland, Germany, Poland, Belarus, Russia, finally into Beijing, China. During the journey, the team will introduce Beijing Olympics to government officials and Olympic Champions, meet with overseas Chinese communities, and will collect millions of signatures of people supporting Beijing Olympics and Chinese re-unification. This activity aims at wishing the Beijing Olympics a big success, promoting the re-unification of China, introducing "One China" policy and "One Country, Two Systems" principle to the world, exhibiting products made in China, establishing a harmonious overseas Chinese community, and showing the world the glorious achievements of China. This long journey is a declaration of passion and patriotism of overseas Chinese to their motherland----China, proudly sending warm welcomes to the world: Welcome to Beijing! Welcome to China!